I’ve had a good couple of months practice with the Privateers and I think I have a pretty good handle on how they operate. My order of activation is working, well, most of the time and I rarely trip over myself too much. I managed to get two final practice games in on Tuesday ahead of this Saturday’s Steamroller event in Gamers World. 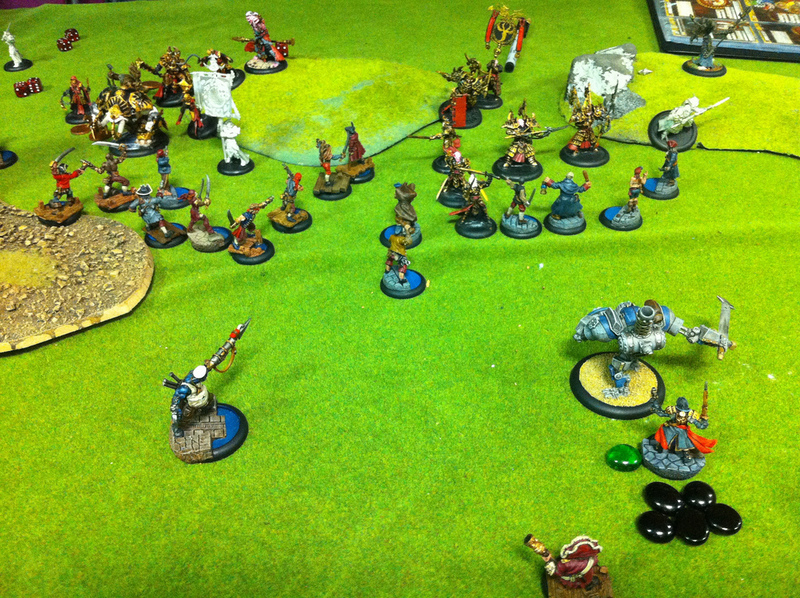 I took on Steve’s Retribution first and then Harry’s Skorne. These are two of the nicest guys to play against – they play hard, but they play fair and I had great fun. Steve’s army was led by Vyros, who I’ve only faced once before. It was a good tight game with my Sea Dogs dishing out a hellish amount of damage on the charge to two of Steve’s units. In response the Retribution decimated the crew and Pressgangers. The game devolved into a slugfest with me trying everything I could to get ranged shots on Vyros. Eventually it paid off and I managed to drop the Iosan ‘caster. The Commodore chipped in, but it’s main role was to keep the Retribution ‘jacks on their asses! The second game was a much more one-sided affair. Again the Sea Dogs and Press Gangers got the hop on my opponent and killed off a swath of Swordsmen and Accuri. My dice were on fire and it seemed that everything I hit, I killed. In the face of so much destruction and with the Commodore having a commanding view of the battlefield, Harry decided that Xerxis would have been in trouble. He was right. Again the big cannon took on the big targets to slam them out of the way. Harry called it when most of his army was in shreds and he had no way of getting at Shae. So, two wins to round out my practice with the Privateers. Let’s see what Saturday brings!